Is she a house cat or is she wild? 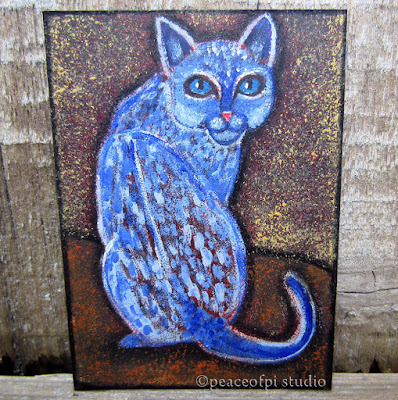 Inspired by Ocelots, Ocicats and Egyptian Mau cats, this painting of a blue cat is created in acrylic. It's miniature sized, 2.5 X 3.5 inches, also known as ACEO (Art Cards, Editions and Originals). This piece is part of a continuing series of paintings in this tiny format where birds and cats are happy to live side by side.